The interplay between an infection during pregnancy and stress in puberty plays a key role in the development of schizophrenia, as behaviourists from ETH Zurich demonstrate in a mouse model. Approximately one per cent of the population suffers from schizophrenia, a serious mental disorder that usually does not develop until adulthood and is incurable. Psychiatrists and neuroscientsist have long suspected that adverse enviromental factors may play an important role in the development of schizophrenia. Prenatal infections such as toxoplasmosis or influenza, psychological, stress or family history have all come into question as risk factors. Nevertheless, until now, researchers have been unable to identify the interplay of the individual factors linked to this serious mental disease. However, a research group headed by Dr. Urs Meyer, a senior scientist at the Laboratory of Physiology & Behaviour at ETH Zurich, has now made a breakthrough: for the first time, they were able to find clear evidence that the combination of two environmental factors contributes significantly to the development of schizophrenia-relevant brain changes and at which stages in a person's life they need to come into play for the disorder to break out. The researchers developed a special mouse model, with which they were able to simulate the processes in humans virtually in fast forward. The study has been published in the March 1, 2013 issue of Science. The first negative environmental influence that favours schizophrenia is a viral infection of the mother during the first half of the pregnancy. If a child with such a prenatal infectious history is also exposed to major stress during puberty, the probability that he or she will suffer from schizophrenia later increases markedly. Researchers at Ludwig Maxmilians University (LMU)-Munich have identify a novel signal transduction pathway, which activates the parkin gene and prevents stress-induced neuronal cell death. The results were published online on February 28, 2013 in Molecular Cell. Parkinson's disease is the most common movement disorder and the second most common neurodegenerative disease after Alzheimer's disease. It is characterized by the loss of dopamin-producing neurons in the substantia nigra, a region in the midbrain, which is implicated in motor control. The typical clinical signs include resting tremor, muscle rigidity, slowness of movements, and impaired balance. In about 10% of cases Parkinson's disease is caused by mutations in specific genes: one of which is called parkin. “Parkinson-associated genes are particularly interesting for researchers, since insights into the function and dysfunction of these genes allow conclusions on the pathomechanisms underlying Parkinson's disease,” says Dr. Konstanze Winklhofer of the Adolf Butenandt Institute at the LMU Munich, who is also affiliated with the German Center for Neurodegenerative Diseases (DZNE). Dr. Winklhofer and her colleagues had previously observed that parkin can protect neurons from cell death under various stress conditions. In the course of this project, it became obvious that a loss of parkin function impairs the activity and integrity of mitochondria, which serve as the cellular power stations. In their latest publication, Dr. Winklhofer and coworkers uncovered the molecular mechanism that accounts for parkin’s neuroprotective action. “We discovered a novel signaling pathway that is responsible for the neuroprotective activity of parkin,” Dr. Winklhofer reports. An explanation has been proposed for the way in which ordered structures arise in cell membranes. Scientists from the Max Planck Institute of Colloids and Interfaces in Potsdam, Germany, have discovered how complex compounds of sugar and lipids – known as glycolipids – order themselves in cell membranes into rafts, namely small, highly organized domains. The arrangement of glycolipids on the surface of plant and animal cell membranes regulates numerous cellular processes. If errors occur in this process, diseases like paroxysmal nocturnal hemoglobinuria (PNH) and bovine spongiform encephalopathy (BSE) can arise. The results were originally published in the Angewandte Chemie International Edition on December 14, 2012. 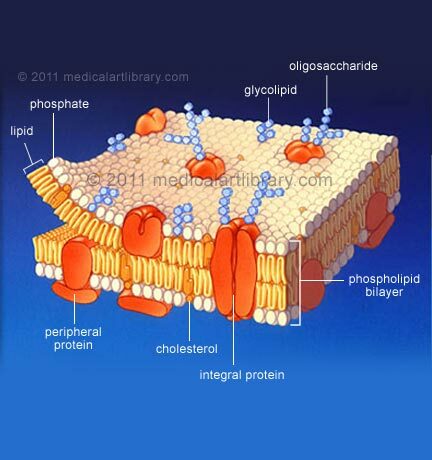 Lipids, i.e. fats and fat-like substances, arise all over the human body. They are the body’s most important energy storage system and are crucial structural components of cell membranes. Compounds formed from complex sugar components and fats are known as glycolipids. These are vital communicators found in the membranes of every human cell, and constantly exchange information about the type and state of the cell. Numerous metabolic processes depend on glycolipids and their recognition. Even the immune system identifies and combats many pathogens using certain sugar structures located on the surfaces of the pathogen cells. Glycosylphosphatidylinositols (GPIs) belong to the group of natural glycolipids. They are found on the surface of plant and animal cell membranes, where they appear either as free molecules or as membrane anchors for various proteins. The arrangement in clusters and their preference for denser and, in part, highly-organized micro-domains in the membrane are seen as essential for the effective functioning of a cell.